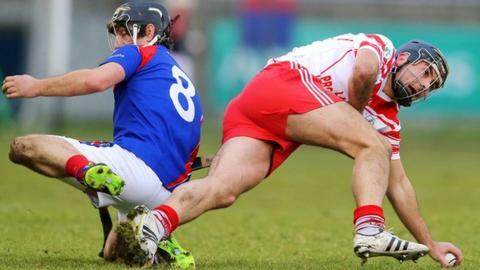 Liam Watson netted a last-gasp free to earn holders Loughgiel a semi-final replay against St Thomas' in the All-Ireland Club Championship. Galway team St Thomas' seemed set for victory by Loughgiel hung in and are still in with a chance of becoming the first Ulster team to retain the title. Watson made the 20-metre free count with eight opponents on the line. Benny McCarry and Shay Casey got the other goals as Loughgiel finished with 3-19 to St Thomas' 1-25. The match had gone to extra-time when St Thomas' Conor Cooney scored a late point. Cooney had a personal tally of 0-12 while Gerald Murray got the St Thomas' goal in the 70th minute. Loughgiel skipper Johnny Campbell was confident the Antrim side could finish the job in the replay. "There is more to come from us," he said. "They hit us hard at the start of each half and we always seemed to be chasing the game. "People were asking if we still had the hunger after last year. I hope that has answered a few questions." The winners of the replay will meet Kilcormac-Killoughey in the final..